Operation Get Active hosted the inaugural Corporate Cup on Oct. 12 at 4:30 p.m. at the newly renovated Miller Park in the center of downtown Chattanooga. 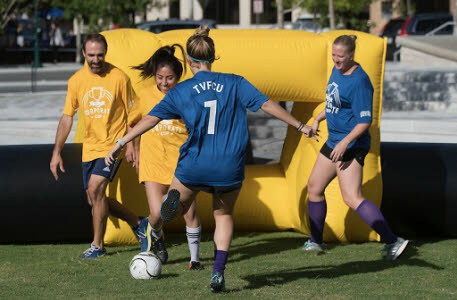 The Corporate Cup served as a fundraiser for Operation Get Active, with all funds directly supporting Operation Get Active’s flagship after-school soccer programming. The companies that participated were Coyote Logistics, EPB Fiber Optics, Trident Transport, Monen Family Restaurant Group, Erlanger Sports Medicine, the Innovation District and Tennessee Valley Federal Credit Union. 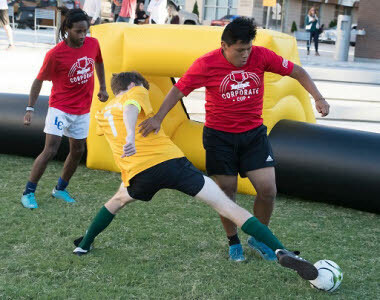 Operation Get Active is a health initiative program that uses the game of soccer to encourage young people in Chattanooga to live active and healthy lifestyles. Programming includes twice-a-week after school-soccer sessions lead by trained OGA coaches in the fall and spring season. Schools where OGA operate are primarily located in under-served areas of the Chattanooga community. When OGA first launched in the spring of 2016, OGA operated in three elementary schools and reached 200 children. For the spring of 2019, OGA projects that it will operate in twenty three elementary schools and reach over 900 children. The Corporate Cup fundraising event had a $1,000 fundraising goal per business. Overall, the event brought in $6,390; with the highest fundraising teams being EPB Fiber Optics, Coyote Logistics and Trident Transport. The cost to operate an OGA after-school program is $4,000 (per school, per semester). Each team was given a specific school to support for the Spring 2019 OGA season. Coyote Logistics and the Monen Family Restaurant Group will be supporting Red Bank Elementary School. Tennessee Valley Federal Credit Union and Trident Transport will be supporting Lookout Valley Elementary School. EPB and The Innovation District will be supporting Bess T Shepherd Elementary School. Erlanger Sports Medicine will be supporting Hixson Elementary School. The tournament was formatted for each business to play six 10-minute games. The games were played to be fun and friendly with a healthy dose of competition. Ben Schulhof of Coyote Logistics had a great time at the event. “It was awesome to see the new Miller Park space used to bring people together to have fun and raise money for OGA. We had perfect weather, great competition and, most importantly, a successful fundraising effort. I know we are already look forward to next year," he said. The overall tournament winner was Coyote Logistics, with Trident Transport in second place, and The Innovation District finishing third. Chattanooga Football Club themed prizes were awarded to the winners of the tournament and to the highest fundraisers. Peter Woolcock, director of OGA, thought the inaugural Corporate Cup was a great time for all that participated and said. “These funds will directly benefit the kids in our community who need it the most. We’re so grateful that Chattanooga has such a philanthropic spirit, and we’re proud to be a part of its youth development," he said. Sheldon Grizzle, Interim GM and president of Chattanooga FC played on The Innovation District team for the Corporate Cup. “We are honored to help OGA expand their impact throughout schools in Hamilton County. We were able to engage the business community in a creative and fun way to improve the services in Hamilton County schools, which emphasizes how well public-private partnerships work well in Chattanooga," he said. "The Corporate Cup will now become an annual event, and planning is already underway to expand the event to accommodate more teams. We will be releasing more information on the 2019 event in the new year," officials said.